We welcome the interest of prospective students in considering the Electrical and Computer Engineering (ECE) Department at the University of Illinois at Chicago (UIC) for their graduate studies. 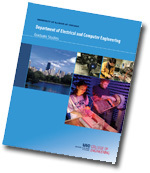 The ECE Department offers graduate programs leading to Electrical and Computer Engineering degrees at the master's and doctoral levels. Consult these pages for current requirements, policies, and regulations. Major research areas in which graduate degrees are offered by the ECE Department include Bioelectronics and Biomimetics, Computer Engineering, Electromagnetics, Device Physics and Electronics, and Information Systems. More information about the ECE research areas and research labs can be found at the ECE Department's web site. Here is the list of the documents you can find on this site. Download our ECE Graduate Brochure. If you are unable to find information that you are seeking, please contact the Student Affairs Office at: (312) 996-4325, (312) 413-2291, or (312) 996-6465 (fax). You may also send e-mail to grad-info[at]ece[dot]uic[dot]edu.